Originally posted on In Between Moderation. I can say I have to agree with a lot of what was written. Far too many people think they are entitled to what they haven’t worked for. Comments disabled here. Please visit the original post to leave comments. Thank you. Lazy, laziness, being lazy. It is almost like a cuss word to me. It would be a lie to say I have never had my lazy moments. We all have them from time to time. But being truly lazy is not really a momentary lack of energy it is a complete inertia and lack of want to move yourself. To be honest it is something that I find truly abhorrent. Especially if you are witness or on the receiving end of someone who is demonstrating laziness. true laziness is a choice. 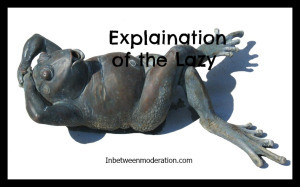 It is a decision and in my view there are three possible causes of laziness.